Motorola is gearing up Cyber Monday, like everyone else on the Interwebz, detailing the deals you can expect to see on its website. Right now, Motorola lists three deals that you can look forward to, but we do hope to see additional deals come Monday. Kicking it off is 25% off a Moto X (2nd Gen) 64GB, bringing the price down from $399 to $299. This deal can be had from within Moto Maker, where you can choose how to customize the device to your liking. Naturally, if you choose for more expensive custom options, your price will go up. 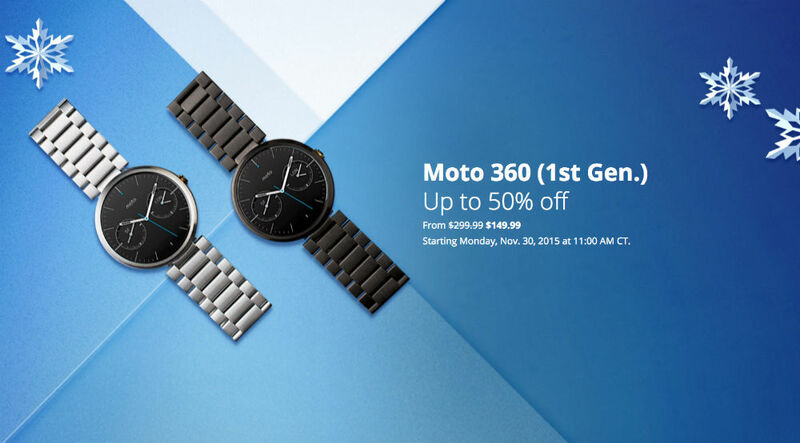 Motorola will also carry the Moto 360 (1st Gen) at 50% off, bringing its price down from $299 to $149. Now, please note, this is the 1st Gen model, and over on Amazon, you can already purchase this device with many different models to choose from starting at about $140. I will say, this must be one of the weaker “deals” in Cyber Monday history. Lastly, those looking for a Moto G (2nd Gen) can purchase one for just $99, down from the MSRP of $179.99. That’s over 40% off the list price for the phone. But again, this is the 2nd Gen model, not the 3rd Gen that is currently available for about $170 on Amazon. You will notice Motorola does not list a single device that was made for the 2015 device lineup. No Moto X Pure Edition, no Moto 360 (2nd Gen), and no Moto G (3rd Gen). Why? Who knows, but that’s why we hope Motorola is saving something special for those who visit their website on Monday. No promises, though. All of these deals kick off on Monday, November 30 at 11:00 AM CT.